SimpleTexting is a marketing text service for companies of all sizes and types. It comes with a complete toolkit for launching effective SMS marketing campaigns. With it, you can create multiple users and use countless keywords. 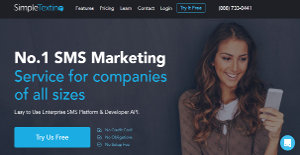 It can be integrated with MailChimp, so that your SMS and email marketing campaigns can join efforts and produce better results. From triggers to image attachments, it comes with a variety of features to shape your text message marketing. You can further integrate the API in your own system and bring everything in one fold. Simple Texting also provides simple web forms and social media integrations to help maximize their reach to potential customers. Simple Texting lives up to its name and truly simplifies the SMS marketing procedure. Whether you are a startup or a big corporation, it can provide you with every feature you could possibly need for a successful SMS campaign. Your messages will not just be simple and boring text anymore. Instead, they can be filled with diverse contents like links, images, codes and you can even include a poll. This creates chances of getting better responses from your audience. Also, with auto response and threaded conversation you can provide further relevant information. The service is location based so you send texts where they will be relevant. Moreover, the plans offer a lot of variety and you only pay according to your usage. With MailChimp integration, you can bring together all of your your marketing endeavors. You can personalize text messages by collecting data from your subscribers. You can also monitor the progress of your campaign thanks to immaculate visual presentation. With quality text messages, your sales can mushroom in days and your brand presence will increase too. Furthermore, quality customer support is just a call away. Whatever your issue may be, a representative can help you anytime. The short code is super easy to remember and can be helpful in starting a dialogue with the potential customers. Each business has its own characteristics, and might call for a special Marketing Software solution that will be adjusted to their company size, type of clients and staff and even specific niche they deal with. It's not wise to count on locating a perfect services that will work for each business regardless of their history is. It may be a good idea to read a few SimpleTexting reviews first and even then you should remember what the solution is intended to do for your business and your workers. Do you require a simple and intuitive solution with only elementary functions? Will you really make use of the complex tools needed by experts and big enterprises? Are there any particular features that are especially useful for the industry you work in? If you ask yourself these questions it will be much easier to locate a trustworthy app that will fit your budget. How Much Does SimpleTexting Cost? We realize that when you make a decision to buy Mobile Marketing Software it’s important not only to see how experts evaluate it in their reviews, but also to find out if the real people and companies that buy it are actually satisfied with the product. That’s why we’ve created our behavior-based Customer Satisfaction Algorithm™ that gathers customer reviews, comments and SimpleTexting reviews across a wide range of social media sites. The data is then presented in an easy to digest form showing how many people had positive and negative experience with SimpleTexting. With that information at hand you should be equipped to make an informed buying decision that you won’t regret. What are SimpleTexting pricing details? What integrations are available for SimpleTexting? If you need more information about SimpleTexting or you simply have a question let us know what you need and we’ll forward your request directly to the vendor.